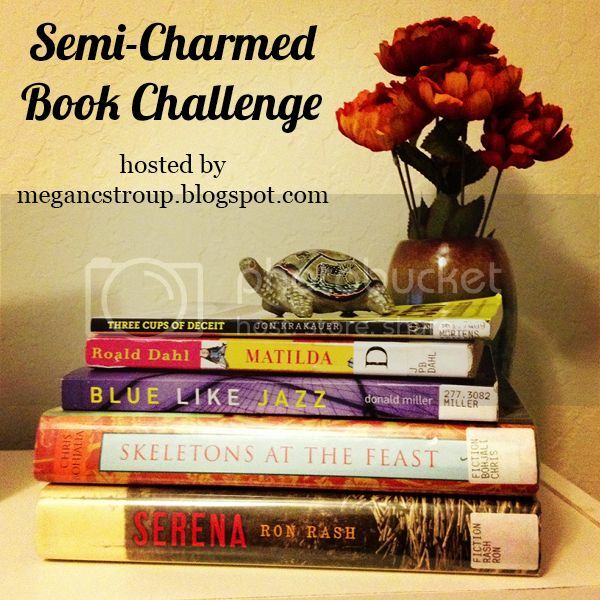 It's time for the first autumn installment of the Semi-Charmed Book Challenge! :) Don't worry, you still have a week to finish up any books you're working on for the summer challenge. That one will end at 11:59 p.m. on Monday, September 30, and the autumn challenge will start at 12 a.m. on Tuesday, October 1. Woohoo! The challenge will run from October 1, 2013, to December 31, 2013. No books that are started before 12 a.m. on October 1 or finished after 11:59 p.m. on December 31 will count. New rule: In the past, I haven't allowed rereads because I said I wanted you to experience new books with my challenges. Now, however, I've decided up to three books for the challenge can be rereads. This is to allow you to revisit books from your childhood or young adulthood that you might get more out of now, or to finish books you started a long time ago but never completed. Please reread the entire book within the timeframe of the challenge in order to count it; no simply finishing old books or partial rereads! Each book must be at least 200 pages long. Audiobooks are fine, as long as the print versions meet the page requirements. A book can only be used for one category. If you want to switch the category later, that's fine, just be sure to account for that in your point total. The highest possible total is 200 points, and the first five people who finish the challenge will win a featured/guest post on Semi-Charmed Kind of Life and be invited to contribute a category for the winter challenge. Good luck! And now for the exciting part: The challenge categories! As of this posting, five people have completed the summer book challenge, and I invited each of them to contribute their own category to the autumn challenge. If you win the autumn challenge, you'll get to help me make the winter challenge! Fun, right? 5: Read a book that does not have "the," "a" or "an" in the title. 15: Read an epistolary novel, which is a book written in letters, emails, diary entries or other documents. See this Goodreads list if you need an idea, but make sure it's actually an epistolary novel first! Goodreads lists aren't verified, so non-epistolary books could have snuck their way on there. 15: Read a book first published in 2013. 20: Read a book on which a television series has been based (e.g. Orange is the New Black, Gossip Girl, Pretty Little Liars, Friday Night Lights, etc.). 25: Read a fiction book that has someone’s first and last name in the title (e.g. The Story of Edgar Sawtelle, The Adventures of Tom Sawyer, Bridget Jones's Diary, etc.). 30: Read two books by the same author. They can be in the same series, but do not have to be. Co-authors do not count (i.e. the author must be the sole author of each book). How to keep track: I’ll post a check-in on the first day of every month, on which you can comment with your progress. I will also include the scoreboard from the previous month on each check-in post. The first check-in post will be Friday, November 1. I will also host a link-up on Monday, September 30, if anyone wants to share their preliminary reading list for the challenge (see an example post from one of my previous challenges here). A preliminary post is not mandatory to join the challenge, but it's a good way to see what other people are planning to read and get some ideas for categories you might be stuck on. Also feel free to share the below button on your blog, Twitter, Instagram, etc., to get the word out! Woohoo! Thank you so much for doing these Megan, I swear I'll finish one someday ;) I've made some progress on the summer challenge but it'd be a miracle if I finished by Monday! I love the last category and thought I'd recommend 11/22/63 by Stephen King. It's a fictional (but highly informative) novel about the Kennedy assassination, and since the 50th anniversary of that will take place during your challenge, it might be a timely read. Yay! I hope I can actually have a good showing this time. Yay! I'm excited to get started on my plan for this one. Thanks for the opportunity to submit a category. This sounds fun! I already have some ideas about which books to read! Oh I've also decided that I will extra challenge myself by only reading books I already own. I know it can be done and I have an unread collection that is embarrassing. I reading like a fiend in the spring and then life got crazy this summer. This looks like the perfect opportunity for me to get back on track, can't wait! Yay! Off to put together my preliminary list and get a signup post ready. Yay- I love to read & just found your summer challenge through Blair's Headband. I can't wait to do this for the Fall as I was looking for some new books to read! Post is up and I'm chomping at the bit to get started! Wow, some great categories! I'll have to give it some thought! Some great categories! I am signing up! Here is my sign up post! Motherless Brooklyn by Jonathan Lethem (311 pages) paired with either The Man Who Mistook His Wife For A Hat (256 pages) or An Anthropologist on Mars (327 pages) both by Oliver Sacks. Yup, I am joining in this one. I can't wait! I'm totally joining only to challenge myself...idk how well I will do! Am I too late to jump onto this? Does the Oprah Book club include Oprah's 2.0 books? I've pretty much read all the others, but have started the 2.0. Currently: celebrating my favorite season!